I love sledding. I love sharing sledding with people, mostly kids. It’s difficult to sell adults on sledding when they have been out of practice. I think I’m old enough to know I’m not going to outgrow sledding. And here’s why. Sledding is not about the “whe-e-e-e!! !” part of going down the hill. Sledding is about walking up the hill. And I like walking up the hill. People who don’t like walking up the hill, don’t like sledding. I hope you enjoy the walk. This entry was posted on Wednesday, January 13th, 2010 at 10:48 pm and is filed under Curious fitness, Curious living. You can follow any responses to this entry through the RSS 2.0 feed. You can leave a response, or trackback from your own site. I’m from Illinois originally. I LOVE sledding. 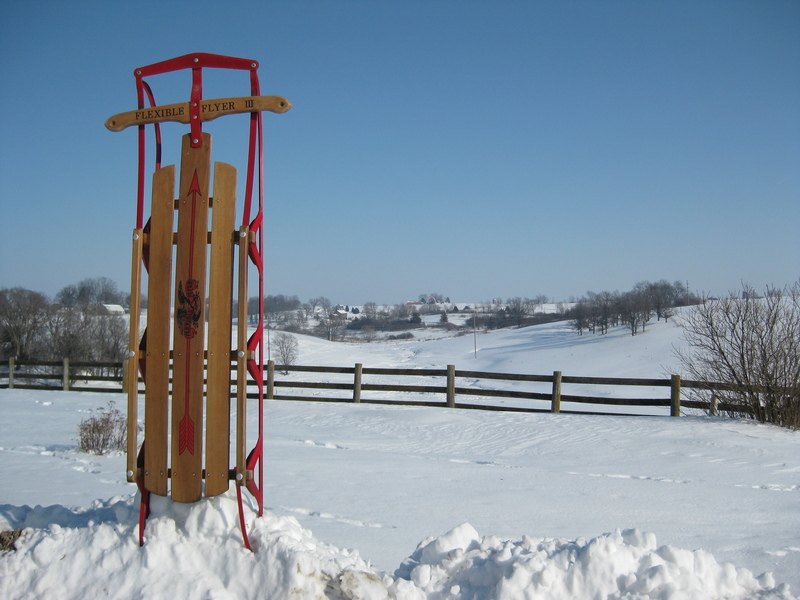 My parents gave us little red short skis one holiday and we flew down the hill, no poles…what are those? hahah…Perhaps they were trying to knock us..no…naw. Oh…love that picture. Even love our old taboggen I saw in the garage last summer while visiting. Cool. When can we join in?? Thanks Karen for your comments! It’s great to hear from someone enjoying the blog! I wouldn’t mind the hill if it wasn’t so dammed steep. I see you moved to your own URL. Enjoy the new digs.